Tears flowed after the last meal had been served at Spanky’s, the landmark restaurant that has anchored the northeast corner of Franklin and Columbia streets in Chapel Hill since 1977. “I hugged Mickey goodbye,” said co-owner Greg Overbeck ’77, referring to Spanky’s co-owner and founder, Mickey Ewell, who was about to retire as the restaurant closed March 31. The two are partners with Kenny Carlson and Pete Dorrance ’76 in the Chapel Hill Restaurant Group, which also announced Spanky’s replacement. Lula’s — named for chef William D’Auvrey’s great-grandmother — will open in May, serving such fare as fried chicken, pork chops, short ribs, farm-to-table vegetables and biscuits, as well as freshly squeezed lemonade and mint juleps. The partners timed the decision with Ewell’s retirement. Ewell sold out to the other three partners, but he still owns some of the real estate housing the group’s four other restaurants: the Italian-American 411 West on West Franklin, seafood establishment Squid’s Restaurant and Oyster Bar on Fordham Boulevard and Mez Contemporary Mexican and the Page Road Grill in Research Triangle Park. “We’ve given Mickey, as part of his retirement rights, eating free at all the restaurants,” Overbeck said. Ewell said he wished the Spanky’s name — inspired by a main character in the Our Gang comedy films of the 1930s — could have been saved, but the other partners thought that with a new menu and concept, a new name was needed to avoid confusing patrons who walked in expecting Spanky’s fare. Diagnosed some years ago with Parkinson’s disease, Ewell could no longer give his all to his work, he said, but his son Harry, a Spanky’s manager, plans to stay on for the new restaurant. Overbeck said that as Lula’s takes over the spot at 101 E. Franklin St., there might be a fresh coat of paint, but the furniture, floor plan, bar and sports on TV will remain. All dining will be downstairs, with the upstairs reserved for special events. 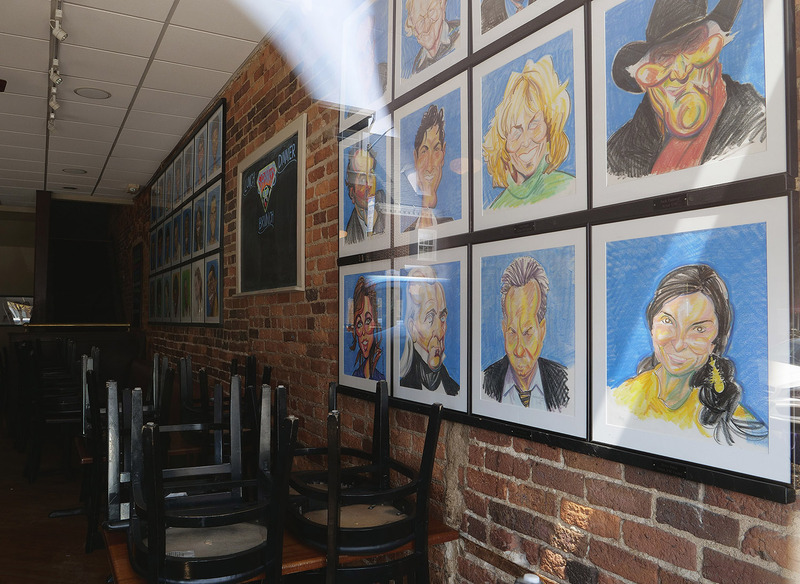 On the walls, blackboards describing specials will replace some 70 caricatures of famous UNC and Chapel Hill figures, including basketball star James Worthy ’85 and his coach, Dean Smith. Overbeck asked former Spanky’s employee Dave Washburn ’88, now of Atlanta, to begin drawing them after their 1982 team won the men’s national basketball championship. What will happen to the caricatures has drawn interest on Facebook and elsewhere. The group has fielded suggestions, but nothing has been decided. In the new restaurant, photos of old Chapel Hill, which hung upstairs in Spanky’s, might take up spots beside the blackboards. Overbeck’s Spanky’s memories start soon after it opened. “I had graduated from Carolina, and my parents were proud that I’d gotten a job as a carpenter’s assistant,” he said, but he added a second job busing tables at Spanky’s and soon found the restaurant to be more fun. “It was a lot easier than being out in the hot sun pounding nails. He said the same thing later on when a cook didn’t show up. And so on, working his way up to manager. After North Carolina law changed in 1978 to allow liquor by the drink, basically opening the way for bars as they operate today, Ewell became the first owner in Orange County to get a liquor license, Overbeck said. Spanky’s boomed in its first 10 years, with annual sales of nearly $1 million, Triangle Business Journal reported. By 1986, Overbeck and fellow longtime employees Dorrance and Carlson were considering starting their own restaurant. Not wanting to lose them, Ewell asked them to put up $5,000 each, go in on a new restaurant and gain 16 percent ownership each in Spanky’s and the new business, TBJ reported. They accepted, and in 1986 the four partners opened Squid’s, Chapel Hill’s first fresh seafood restaurant.